I don't usually blog about what I'm teaching my flock, and vice versa. Today I'm making an exception. n GraceLife yesterday we began a series on the fifteen Psalms of Ascent (Psalms 120-134). 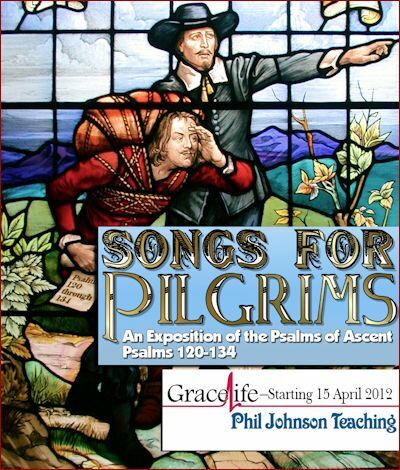 Those psalms, I believe were choruses sung by groups of pilgrims on their way to Jerusalem for the holy festivals. If you were an Israelite in biblical times traveling on foot, no matter where you were coming from, the road to Jerusalem was a long, uphill journey—hence "Psalms of Ascent." That pilgrimage, and the songs that were sung on the way, are full of lessons about spiritual growth and discipleship. For one thing, these psalms contain lots of reminders that redeemed people are exiles and foreigners as far as this present world is concerned. We are citizens of heaven, refugees on a long, upward trek home, learning and growing spiritually along the way. Pondering that fact reminded me of some basic truths about what it means to be a citizen of heaven and a follower of Christ. 1. We are pilgrims, not tourists. We are exiles and explorersnot day trippers or vacationers. We're supposed to be ascending like first-century pilgrims on their way to a feast in Jerusalem, not wandering like the Old Testament Israelites in the wilderness. 2. We are disciples, not academics. We are working apprentices, not merely auditors of a course where we're free to skip the exams. We are interns who are responsible to put what we learn into practice; we're not imbibing information recreationally for the sake of accumulating hypothetical knowledge. Our discipleship is a vocation, not a hobby. 3. We are servants, not superstars. We're members of the churchand it's a community, not a resort. We're here to serve, not to be served. We're motivated by our concern for God's glory, not our own comfort. Our ministry is for the sake of others, not self. We're ambassadors in a foreign land, bringing a message of good news to the weary, wounded, and guilty souls who live there, offering them refuge on higher groundand inviting them to join us on the walk to our home. I'm always amazed at your succinctness, a skill I strive for, and usually fail at. 1. expressed in few words; concise; terse. 2. characterized by conciseness or verbal brevity. Sounds like a good message, Phil. I like the part about being a Pilgrim. The longer I travel on this road, the more I feel like a stranger in a strange land. I find myself searching for other believers, just so I can talk to someone about something of substance. Thank goodness for the internet (and free wi-fi at most hotels). God bless and keep it coming. I am glad you made the exception and posted your points! Each one could be a sermon in and of itself. Is there anyway we can hear (or read) the entire message? I will never understand the interwebs. Good word, Phil. I'd say on point 1 that many Christians act like this world is their home - not even tourists, but owners, as though what they receive here is their reward instead of tools at hand for accomplishing our mission. Point 2 is worth thinking long and hard about. I'd say we are great at landing hard on one theory or another where the text isn't clear. Sometimes the best theological answer is, "I don't know." And so we all get sidetracked arguing over what we don't know but think we do instead of submitting to what is actually given to us to know. Hi, this is such an inspiring and thought-provoking post – would you please be so kind as to give me permission to translate it into Hungarian and to put it on my blog (www.igerenezek.wordpress.com)? Thank you in advance. God bless you. Who Cares About the Opinions of Men?